I have never seen the play performed or the film of the same name. I recall chiefly the scenes of debauchery of two young friends of 12th century England, one a King, the other his Chancellor. But, the text of Murder in the Cathedral is enduring, as befits a Nobel writer (1948). From time to time I pull out the azure and deep red Faber & Faber edition of the book, anxiously awaiting the lines I first heard on that hot Queens street. In these spring days of Pope Benedict’s bid for more and more temporal power and after seeing a documentary on the tragedy of the murder of Archbishop Thomas Becket, I repeated that old ceremony. Maybe you have to live in Rome to be aware that the church-state struggle not only continues but has intensified. The Roman Catholic Church seems to see temporal power as the chief aim of its ministry on earth. In any case, without any pretences of literary criticism on my part, I find that Eliot’s play is an auspicious start for a look at the age-old struggle. Though much has been written about the issue and I fear I will not find much original to say, the importance today of the subject of secular vs. religious power justifies the effort ... also for the reader. So, pray stay with me. His assassination foreshadowed similar political murders of Martin Luther King and of Archbishop Oscar Romero at the altar of a chapel in El Salvador in 1980, both murdered by reactionary death squads. Like Becket’s early relationship with the King, Oscar Romero was at first considered an ally of the ruling oligarchy of El Salvador in the grip of US imperialism. After he was named Archbishop in 1977, mounting repression, attacks on the clergy, murders of priests and the misery of the poor changed his views. Romero became a spokesman for the poor and the message of Liberation Theology so despised and feared by the popes of Rome. Oscar Romero boycotted the new President’s inauguration on July 1, 1977, denying him the blessing of the Catholic Church, and declared the election invalid. Romero outlined in a sermon a moral justification for mutiny against state power. As Thomas had intimated 800 years earlier, Romero said: “If they kill me, I shall arise in the Salvadoran people. If the threats come to be fulfilled, from this moment I offer my blood to God for the redemption and resurrection of El Salvador. Let my blood be a seed of freedom." In our lives we don’t have someone as powerful as Henry II breathing down our necks (not yet, at least). But we do face moral challenges. How to say No … at the risk of being different? Join the majority or dare to remain independent? Display your intelligence or be "cool" all-American and act dumb? As Oscar Romero showed, power struggles are not all the same. But the issues in this play are disturbingly real and perilously relevant to today's world: man’s nearly meaningless place in the conflicts of the era of authoritarian military-industrial power combined confusedly with the churches of philistine fundamentalism, God-is-on-our-side hypocrisy dominating human affairs. On the first level, Eliot's Murder in the Cathedral is a play in verse about the dangers of temptations on the way to sainthood or power. 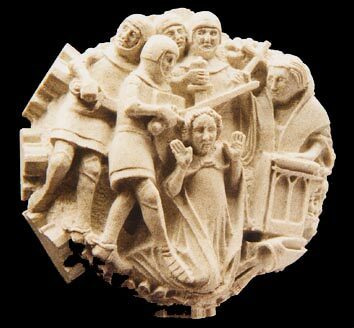 Thomas Becket resisted several temptations coupled with cajolery and threat. He is offered a return to political power alongside King Henry while at the same time he is accused of disloyalty to the nation and his ecclesiastical office and threatened physically. He is tempted with a return to his halcyon youth with his friend Henry, and the concomitant danger of being forgotten by history. As Dostoevsky showed in The Legend of the Grand Inquisitor, centuries after Jesus Christ a world church grew up in His name. The Popes of Rome named themselves His vicars on earth. The former Papal States in Italy, which included Rome, had achieved the status of a country with relations with other countries. When on Christmas day in the year 800 the Pope crowned Charlemagne Emperor, the Church gained power over the entire Holy Roman Empire. Church and State were one. In our times, though officialy separated, Church and State are often one. Temporal power remains distant from religious doctrine and the pastoral mission, its temporal bent is in fact one of the Church’s worst aspects. Despite the Church’s explanation that temporal power is one of those unavoidable bridges that must be crossed in order to disseminate the Catholic faith, what can the doctrine of Jesus Christ have to do with power on earth? Besides, over and over again religions have shown they have no capacity whatsoever for temporal power. If not for Eliot’s own religious hang-up, his play Murder in the Cathedral could have centered on politics, not morality and religion. Instead the play is seen strictly from the Church’s point of view. In that sense the murder of Thomas Becket at Canterbury was of less importance then than the assassination of Archbishop Romero in El Salvador today. Thomas’ was in fact more a rogue killing by soldiers who thought they were carrying out what their King wanted done. Maybe Becket died from an act of stupidity—which was most certainly not the case of the murders of Oscar Romero and Martin Luther King. Power knew exactly what it was doing. Still, because of the power of the Church in the England of Henry II, murdering an archbishop was a dangerous act. Not so for the perpetrators in the El Salvador of our times where the hierarchy of the Roman Church stood on the side of brutal imperialist-capitalist power. To Eliot and the modern reader, Thomas’ murder was of less importance than the democratic belief that not even the king is above the law. For that reason, I believe, Eliot centered the play on Becket’s motives for sainthood, not on his resistance nor on Henry’s potential quest for redemption, and who knows? perhaps he really hoped for an epiphany. Though the play was written at the time of the rising of Fascism and Nazism in Europe and can be understood also as an individual's opposition to authority as in the Greek play Antigone, Becket’s internal struggle over his opposition to Henry II is in my reading secondary. Henry II improved the affairs of his kingdom, reaching from Scotland to the Pyrenees. Though he failed to subject the Church to his courts, his judicial reforms endured. His centralized system of justice and modern court procedures replaced the old trial by ordeal. He initiated the concept of “common law” administered by royal courts, thus encroaching on feudal courts and on the jurisdiction of Church courts. He decreed that priests should be tried in royal courts, not in Becket’s ecclesiastical courts.